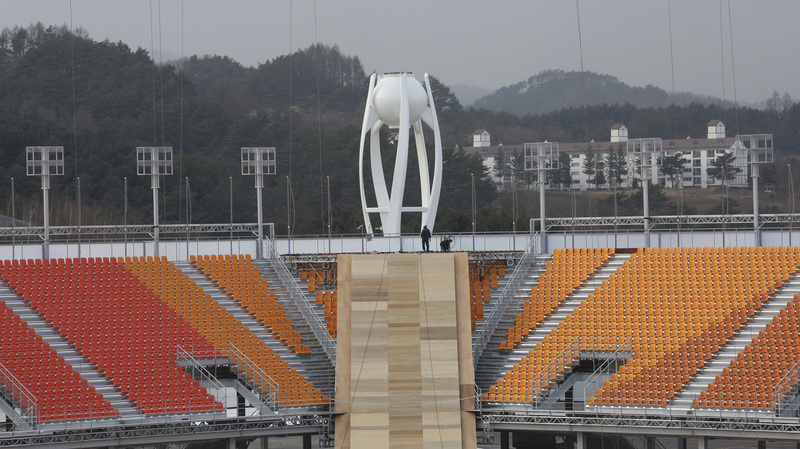 South Korea Prepares To Spend $13 Billion On Winter Olympics. Is It Worth It? Despite bold plans to repurpose Olympic buildings, past host cities, such as Rio de Janeiro and Athens, have been left with vacant, decaying sports complexes and piles of debt. The Pyeongchang Olympic Stadium cost roughly $109 million to build for South Korea's 2018 Winter Olympics and Paralympics. The stadium will be used just four times before being demolished. The $109 million stadium is raising questions about whether hosting the Olympics is worth the cost for cities that don't have existing infrastructure to accommodate the event. The Pyeongchang stadium is one of several new arenas, event spaces and lodging structures built for the Olympics, which could cost South Korea nearly $13 billion. Despite bold plans to repurpose Olympic buildings, past host cities, such as Rio de Janeiro and Athens, have been left with vacant, decaying sports complexes. Organizers in South Korea are planning to demolish some of the new buildings after the games rather than risk their becoming white elephants, says Judith Grant-Long, an associate professor of sport management at the University of Michigan and a co-director of the Michigan Center for Sport and Policy. "It's not so unusual to see temporary facilities used in the context of the Olympics, but this moves the needle towards disposable facilities," she tells Here & Now's Peter O'Dowd. "And I think the cost of this particular venue at approximately $100 million is really making people sit up and take notice about the costs associated with building venues." The region's modest population is one reason repurposing the stadium doesn't make much economic sense. There are only about 40,000 people in Pyeongchang County, which makes it almost impossible to regularly fill the new stadium that seats 35,000. 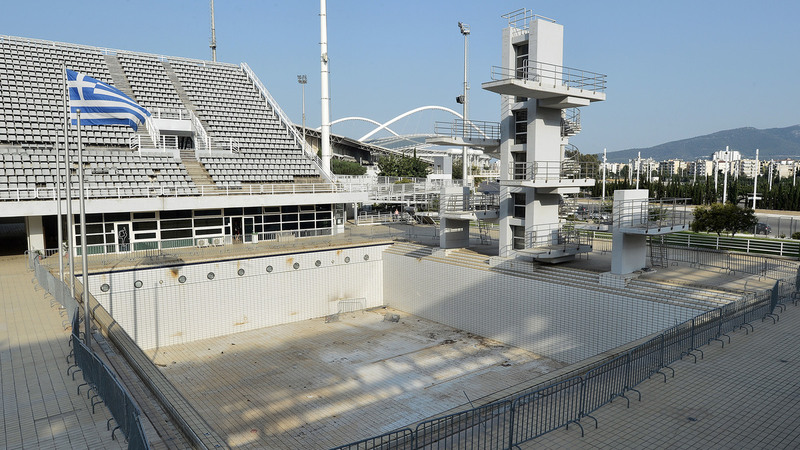 The Olympic Aquatic Center in Athens sits vacant since the 2004 Summer Olympics. Greece's economic frailties post-Olympic Games have prevented any further investment, and the majority of the newly constructed stadiums now lie abandoned. South Korean officials are hoping the Olympics will boost the area's population by creating a new tourism cluster, Grant-Long says. Olympic organizers in Sochi, Russia, had similar goals, but unlike Russians, South Koreans don't care much for winter sports. A survey taken last April by the South Korean Ministry of Culture, Sports and Tourism found that only 35.6 percent of people were interested in the Winter Olympics. "The other issue with the success of this particular strategy in that location is that South Koreans at this point in time are not particularly a winter sport people," Grant-Long says. "So the idea of creating a tourism strategy that's based on winter sports, skiing and so forth, has not necessarily been a well-received idea from an economic development point of view." Financial problems after the Olympics and other international sports events are common. It took Montreal 30 years to pay off its debts after the 1976 Olympics. The city's Olympic stadium was recently transformed into a refugee welcome center for asylum seekers entering Canada from the U.S.
Athens spent more than $15 billion to stage the Summer Games in 2004, adding to the country's debt and sparking the current economic turmoil. The games did bring much needed development to the metro system, highways and an airport, but graffiti-covered stadiums remain unused. In Rio, organizers are still staring down $40 million in debt incurred during the 2016 Summer Games after ambitious plans to convert arenas into schools collapsed. And the $550 million World Cup stadium in Brasilia, Brazil, was turned into a bus parking lot after the 2014 soccer tournament. 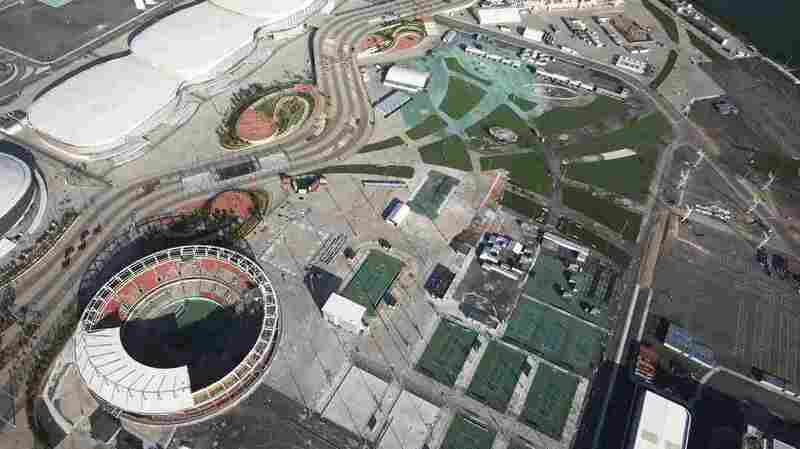 Some remaining tennis courts stand next to the main tennis stadium in Olympic Park in Rio de Janeiro last year. Nearly two years after Rio hosted the first Olympic games in South America, many of the costly venue sites are shuttered or underused amid a deep economic crisis in the city. "Most countries end up with a lot of debt, a lot of white elephants, and quite a bit of infrastructure investment that is not ideal for the type of development needs that the city has," Andy Zimbalist, a professor of economics at Smith College in Northampton, Mass., told NPR in 2014. Experts say most cities that decide to host the Olympics will confront mountains of debt, especially if they don't have the infrastructure already. Construction companies often drive city officials to make higher bids by presenting more elaborate plans. "If you're going to organize the games, you have to be prepared for financial surprises — I'll put it politely — and debt," Olympic historian David Wallechinsky told NPR last year. "But it can be done, and it has been done. The London Games didn't lose money. The 1984 Los Angeles Olympics made a profit, and in fact, that profit has been put to wonderful use." The 1984 Games generated a $225 million surplus, which has been used to support American Olympic efforts and local youth sports organizations over the past three decades, according to The Los Angeles Times. At the end of last year, Paris and Los Angeles were chosen to host the Olympic Games in 2024 and 2028. The International Olympic Committee says the cities were picked because of their plans to use a "record-breaking number of existing and temporary facilities." Grant-Long says choosing those cities is part of the IOC's goal "to figure out what is a sustainable path forward, and it's either a single site, a set of permanent sites, or really recalibrating the games around a much more modest idea." A previous version of this story incorrectly said the World Cup soccer tournament was held in 2015. It was actually in 2014.